Twenty years ago, the computer game Myst from Spokane developer Cyan began with a book in a fissure under stars, a window that sucked the player into a series of strange new worlds. Obduction – the spiritual successor to Myst – will begin almost the same way. On a clear starry night, you stumble across a strange artifact and you’re transported to an alien world. That is, if it gets funded and if it gets made. Today, Cyan went live with their much-anticipated Kickstarter, asking fans for $1.1 million over the next 30 days to fund a spiritual successor to Myst and Riven. — Obviously, Cyan doesn’t want to give too much away. Even some of the descriptions on the concept art have been redacted, as if crossed out with a black CIA marker. That’s intentional. — Miller has had this idea for ages. In fact, Miller’s long been a sci-fi fan. He remembers reading science fiction all the way back when he was in junior high in New Mexico. “I love science and science fiction,” Miller says. “The idea of being on another planet. Or even watching robots on another planet was amazing to me.” In particular, he cites Starman Jones, a 1953 novel from famed sci-fi writer Robert Heinlen, about a farmboy from the Ozarks who wants to travel to space. “I remember it vividly, picking it up off the shelf,” Miller says. And what does one of Obduction’s first pieces of concept art show? 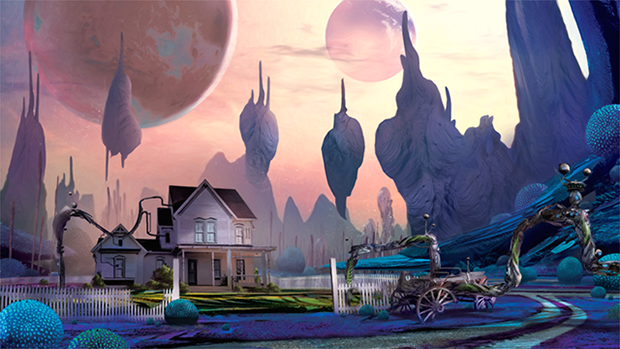 A farmhouse and a white-picket fence, which feels plucked right out of the 50s, mysteriously existing on an alien world. — The story does not take place in the Myst universe. Expect the usual Easter Eggs and subtle references to their other games, but don’t expect to find linking books or the D’ni language or anything like that. This is purely its own story. — But there will be other characters. “I think you’ll discover, after this abduction takes place, that you are not alone,” Miller says. — When I heard the name last night, I first thought it was just a tweak of abduction. But then I looked up the definition online and found that, no, it was an actual word. 1. The act of drawing or laying over, as a covering. 2. A geologic process in which the edge of a tectonic plate consisting of oceanic crust is thrust over the edge of an adjacent plate consisting of continental crust. So maybe Cyan is creating that plate tectonics simulator the gaming world has long been demanding. — “Interesting juxtapositions” play a key role in both the art style and the story. An alien vine interwoven with a rusted cart. A farmhouse under a purple sky. “One of the things very important was this: things that seem out of place,” Miller says. — While selling a million copies would be nice, Miller says he’ll define the game’s success by the reactions he observes as people play the game. He wants to watch them struggle, struggle, think, ponder, and finally come to epiphany. Often, while play testing, he’ll put two people together who’ve never played the game, and observe how they ruminate, question, explore, and finally come to their own solutions. — After confronting well-designed puzzles, Miller says, the player should blame themselves for not solving it sooner. Even if they cheat by looking up the solution on the Internet, it should feel logical in retrospect. It’s a bad puzzle if they just blame Cyan. Miller cites the example of the infamous subway maze puzzle in the sound-themed “Selenic Age” in Myst. Players had to figure out the secret to navigating the maze was to listen to the sounds that emitted at crossroads. But in retrospect, he says, the sounds needed to be a bit louder for most people to make that connection. — Cyan will be hiring more people to make this game. Miller expects the team to be a bit smaller than the 30 to 40 people who made Riven, but larger than the approximately 10 people who made Myst. — Time to get nerdy. Instead of the slideshow click-and-move style of Myst and Riven, Obduction will allow for full movement, and be created on the Unreal 4 engine, a state-of-the-art game engine that was just introduced recently: Here’s a tech demo of what the engine can do. The predecessor, Unreal 3, was used to make gorgeous games like Bioshock Infinite and Dishonored. — Right now, the estimated release date is October 2015. But take that with a grain of salt. Most Kickstarters regularly underestimate the amount of time needed to create their product. This happens with video games of course, too. “We discussed this internally,” Miller says. “We want to be realistic. We are also putting the best case out there.” It took about two years to do Myst, about four years to do Riven, and even longer to attempt to design the massive multiplayer game Uru. 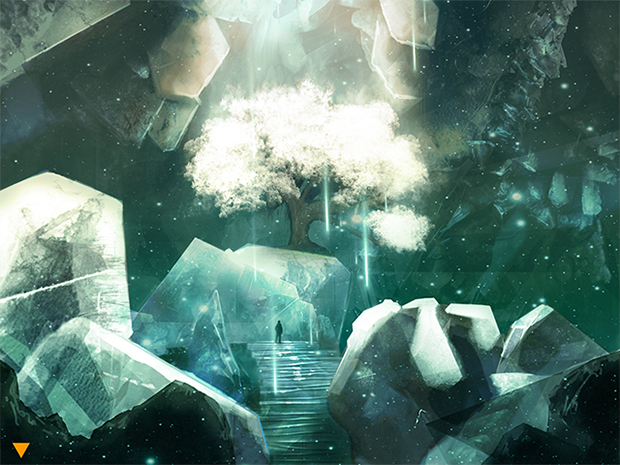 — For now, expect the game to be about the size of Myst. “I think we are shooting for an experience similar for Myst,” Miller says. “Some people played it in a few hours, and some people took 40 hours.” Of course, the game’s size could change depending on how much money they rake in. — The Kickstarter page went live just this morning at 6 am, and it raised nearly $100,000 within hours. If history is any indication, it would be a surprise if the project didn’t reach its funding goal. Adventure games – especially adventure games with a built-in cult audience – have been shunned by publishers but have achieved some of the biggest support on Kickstarter. Successors to games like Dreamfall and The Neverhood have already been completely funded. Kickstarters, of course, can be problematic. A board game called “The Doom That Came to Atlantic City” raised over $122,000 – nearly $100,000 more than they said they needed – but then the creators pulled out, forcing another party to come and save them. “The danger that you learn from being a software developer is the money that you think you need is not always enough,” Miller says. “We’re trying to anticipate that ahead of time.” But he also says that, even after doing this for 30 years, there’s still a danger in spending more than projected. — Deciding the reward levels was a challenge. Over 350 have paid $25 dollars or more, enough to get the game when it releases. Two backers have already paid $850, which allows them the chance to either design an item in the game, or provide an image to be used in an Easter egg in the game. So far, though, no one has shelled out $10,000 for the top tier reward, which includes an invitation for a full design session at Cyan’s headquarters. — And what happens if Cyan raises more money than the goal? In Myst, he says, Cyan could have added an entire additional “Age” to explore. Beyond that, Miller says he could see creating the game for additional platforms, like Linux or the iPad, or even porting it to the virtual reality systems like Oculus Rift. One of the most successful computer game Kickstarters, Tim Schafer’s Broken Age adventure game, garnered $3.3 million – over 8 times the amount he originally requested. But with more money came a grander vision, a bigger goal, and soon, even that wasn’t enough. Schafer made headlines by announcing he would be splitting the game into two, and using the additional revenue raised from those buying the first half to finish the second half. I asked if Cyan would be able to avoid “feature creep,” a challenge where the development stretches out further and further as the developer continues to come up with more and more cool stuff for the game. But even with the bare minimum of funding, Miller says, he's sure the team can create a cool game. But with more money? Then they can make an even cooler one. THIS WEEKEND/WEEK IN MUSIC: Why does everything have to happen at the same time?